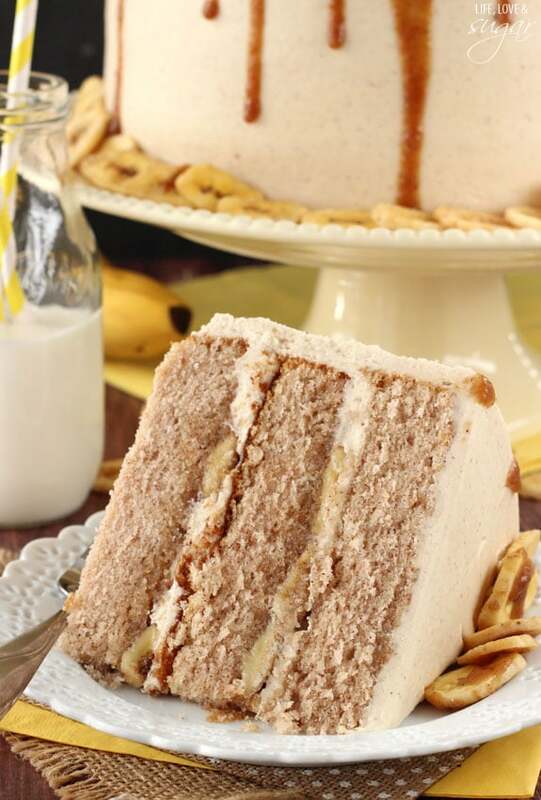 This Bananas Foster Layer Cake is a delicious combination of the wonderful flavors of banana foster. 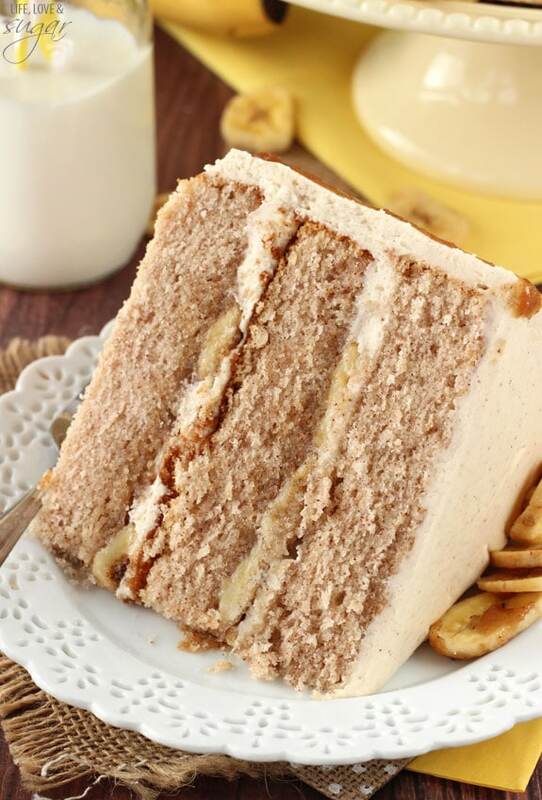 The soft cinnamon cake, the rum fosters sauce, the bananas, the rum fosters icing – it all comes together to make an amazing cake! Well, we had a lovely weekend. One of the things that stuck out in my mind a lot after the blog conference I went to last weekend was that I need to make more time for myself to relax and recharge a bit. Between working full time and all the work that goes into this blog, it’s hard. It’s so much easier said than done, but I’m making a big effort. Then, the weather here was absolutely beautiful all weekend. Both days, we put Jessie in the car and drove over to the Greenway. It’s basically a big long boardwalk/path that goes through the woods in our area. It goes for miles and miles. We went on nice walks and enjoyed the warmth and outdoors. We actually wanted to go to another park yesterday, but sadly it seems that the majority of parks in our area don’t allow dogs. We aren’t too far from Lake Lanier and every park we’ve looked at around there has a policy against dogs. It’s pretty frustrating, because we love to take Jessie to new parks with new smells and things for her to explore. Oh well. At least we have the greenway. There’s a lot of water around part of it near us. Some of it is standing water, and you hear frogs like crazy, and other parts are moving streams. There’s one spot where we let Jessie go into the water a little bit. She stays on the least, but walks in and runs around a little. She doesn’t actually like water, but she seems to like that water. It mostly just covers her paws. It’s funny though, because she’ll walk into the water and walk around a bit. Then it’s like she all of a sudden realizes she’s in water, freaks out, and runs out onto the bank and looks at you all wide-eyed. Then she runs back in and does it all again. It’s the cutest thing. Other than that, we didn’t do much. We purposely tried to relax and stay at home a little more this weekend after being gone two weekends in a row. We just enjoyed being home. Of course there was some baking, photo taking and general blogging stuff thrown in there. But I mostly just got caught up after being gone so much. It was quite nice. And I couldn’t wait to share this cake with you. It is a bananas foster dessert at its finest. Surely you guys know by now that I love cinnamon. I’m pretty sure I’ve said it here about 5,462 times. It’s a weakness. When you throw in bananas and rum, you might as well stick a fork in me – I’m done. I can’t say no. The cake layers are actually a cinnamon version of a vanilla cake I’ve made several times over the last few years. It’s a wonderfully moist and light cake. So soft. And it gets even better after you’ve frosted it. Seriously yum. I will tell you though – it doesn’t work well as cupcakes. Sadly, the cupcakes actually separate from the liners when they cool. I know, bummer. But it’s nice when you’re making a cake – it doesn’t stick to the sides of the pan. I’d still recommend greasing the pan though,just in case. Obviously the fosters sauce is one of the most important parts of this cake. Omg, the fosters sauce. I could drink it with a straw. And it could not be more fun to make. You do need to be careful though. It is fire, after all. 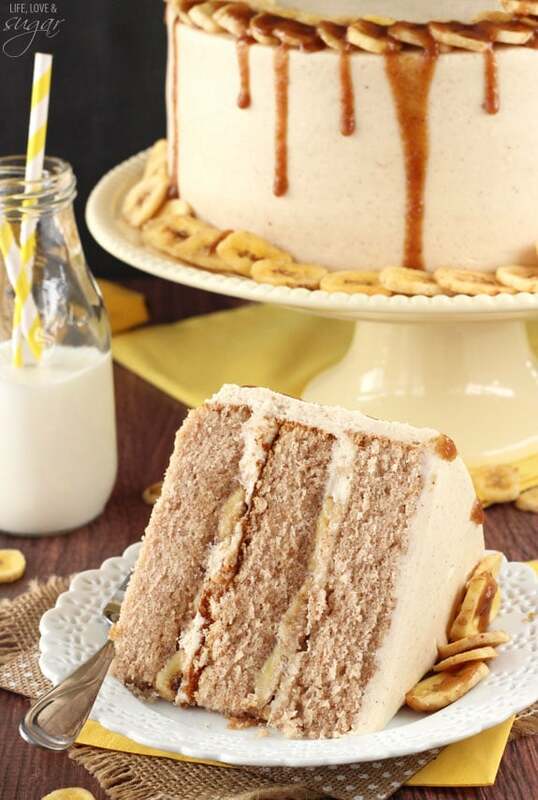 The fosters sauce is used in the icing, on top of the cake, and on the cake layers – it soaks right into them. 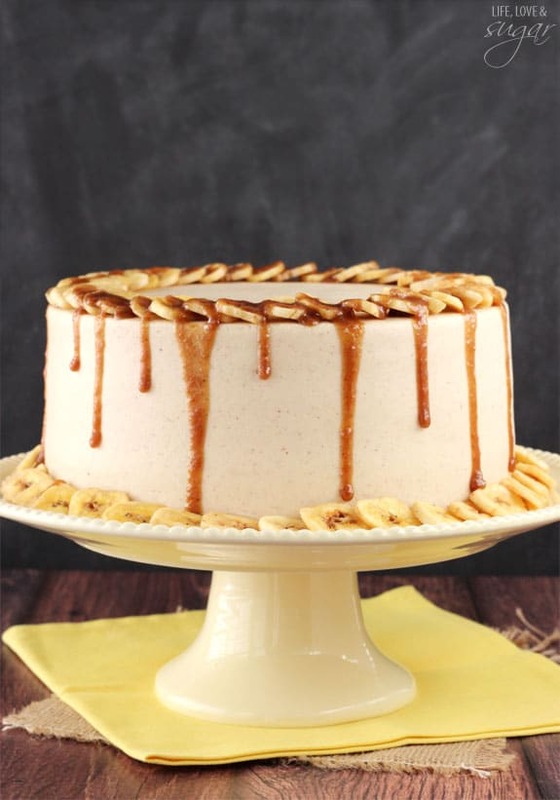 It all ensures that you don’t miss the fosters in this bananas foster layer cake. And then the bananas. Of course. Love those suckers too. They are in between the layers of cake. 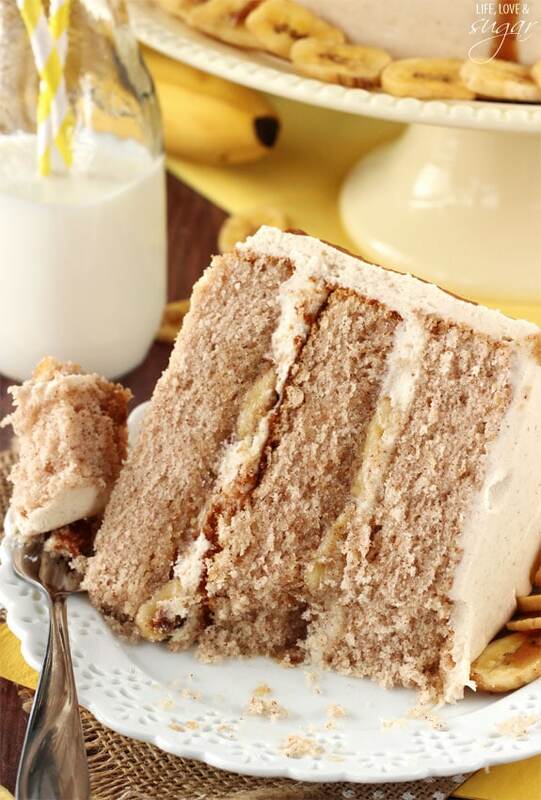 You’ll need to have an edge of icing around the edge of the cake when you add the bananas (known as a dam). It holds the bananas in place so that they don’t start poking out of the sides of the cake. Very important. 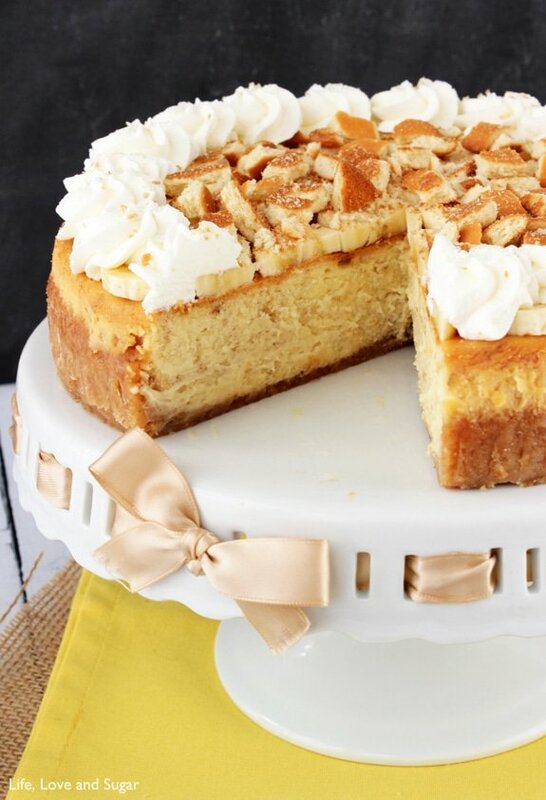 You can add as many bananas as you want, really, but too many and the cake might slide around a bit. The icing is flavored with the fosters sauce and is to.die.for. 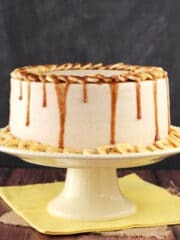 You’ll fill in blank space around the bananas with some of the icing to help the next cake layer have something to grab onto and stay in place. Bananas are slippery little things. 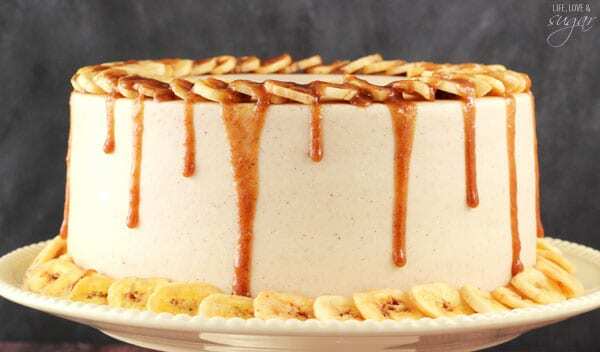 The whole cake, after being iced, is topped with more bananas and a drizzle of fosters sauce. I used banana chips on the outside so that they didn’t get brown and gross looking, but go with your preference. Either way, this cake is a stunner and is absolutely to die for. Heaven in cake form. You have to try it. 1. Grease the sides of three 9 inch round cake pans and line the bottoms with parchment circles. Preheat oven to 350 degrees. 2. 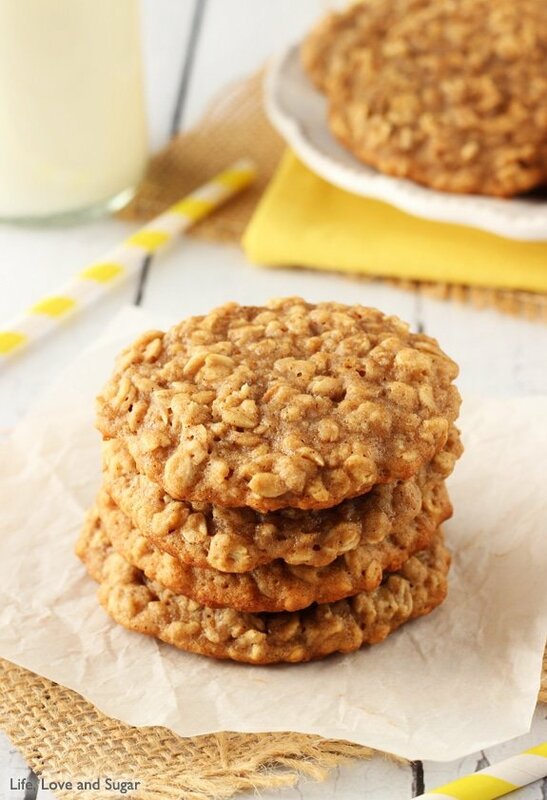 In a large bowl, beat the butter and sugar until light and fluffy, about 2 minutes. 3. Add egg whites and vanilla and beat on medium speed for about 1 minute. 4. 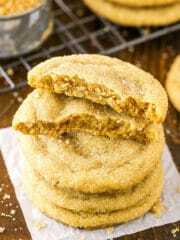 Combine flour, baking soda, baking powder and cinnamon in a medium bowl. 5. Add about 1/3 of the flour mixture to the egg mixture and mix until incorporated. 6. Add about half of the buttermilk and mix until incorporated. 7. Continue adding dry and wet ingredients alternatively and beating until incorporated after each addition. End with dry ingredients. 8. Divide batter evenly into cake pans. 9. 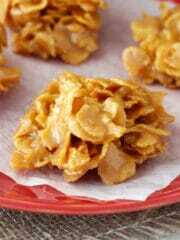 Bake 25-35 minutes, or until a toothpick inserted comes out with a few crumbs. 10. Allow cakes to cool for 5-10 minutes, the remove to a cooling rack to finish cooling. 1. Once cake is cool, melt butter in a large skillet over medium-high heat. 2. Add brown sugar, nutmeg, cinnamon and heavy cream and stir until sugar is dissolved. 3. Pour rum into pan, then use a lighter (or something similar) to light the rum. Be careful, the flame can get somewhat high. Once lit, allow it to cook, swirling the pan a few times to disperse the rum and flames. It should burn out within a minute or two, but if not, swirl a little more to help it burn out. 4. Continue cooking another 1-2 minutes to thicken sauce. 5. Remove from heat, whisk another minute, then pour into another bowl to cool for about 15 minutes. Set about a 1/2 cup plus 3 tbsp of sauce aside in another bowl. The larger amount of sauce will go into the icing. 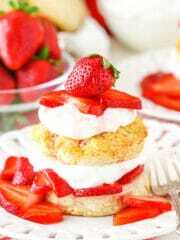 The smaller amount will be used in the cake and on top. 1. While fosters sauce cools, combine cinnamon and sugar in a small bowl. 2. Pour over sliced bananas and toss to coat. 1. In a large bowl, beat butter and shortening until smooth. 2. Add 4 cups of powdered sugar and mix until smooth. 3. Add the fosters sauce made above and mix until combined. There should still be another 1/2 cup plus 3 tbsp set aside for the rest of the cake. 4. Add cinnamon and remaining powdered sugar and mix until smooth. Add water until you get a nice, smooth consistency. 1. Remove the domes of the cake layers with a large serrated knife. The cakes should be fairly flat, but flatten them out as needed. 2. Place first layer of cake on your cake stand or plate. 3. Spread 1/4 cup of fosters sauce over the cake layer and let it soak into the cake. 4. Pipe an icing dam around the edge of the cake. 5. 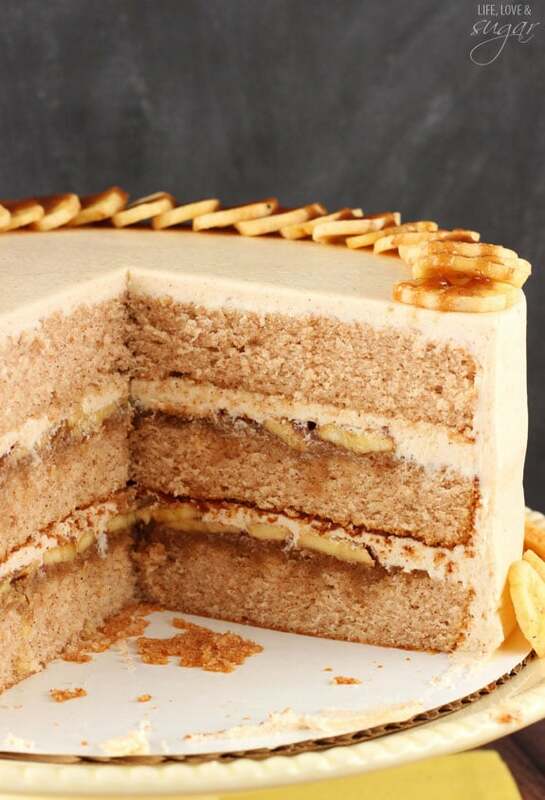 Add a layer of sliced bananas within the cake dam. 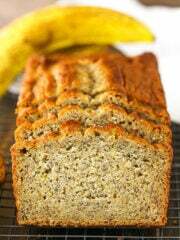 Fill in the space between the bananas and spread a thin layer of icing over the bananas. 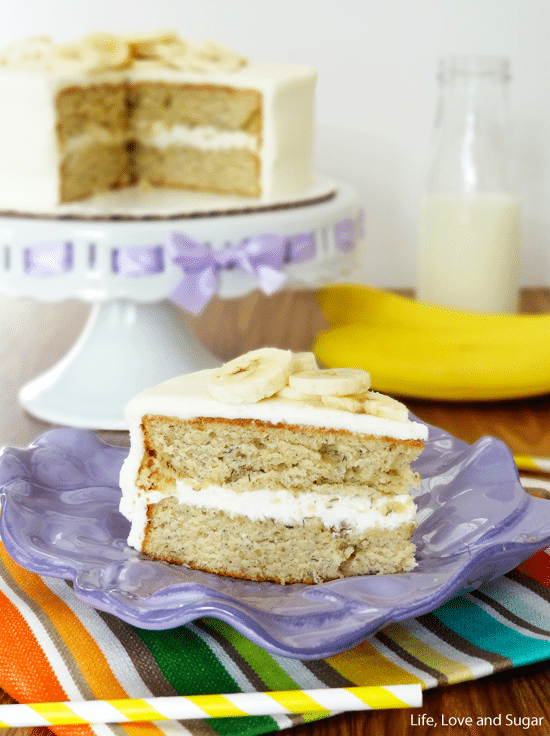 The bananas can poke through the icing, but it should be an even layer, so that the cake is flat. 6. Repeat steps 2-5 with the second layer of cake. 7. Place remaining layer of cake on top. 8. Ice the outside of the cake. Start by filling in the spaces between the cake layers, then ice the full cake. 9. 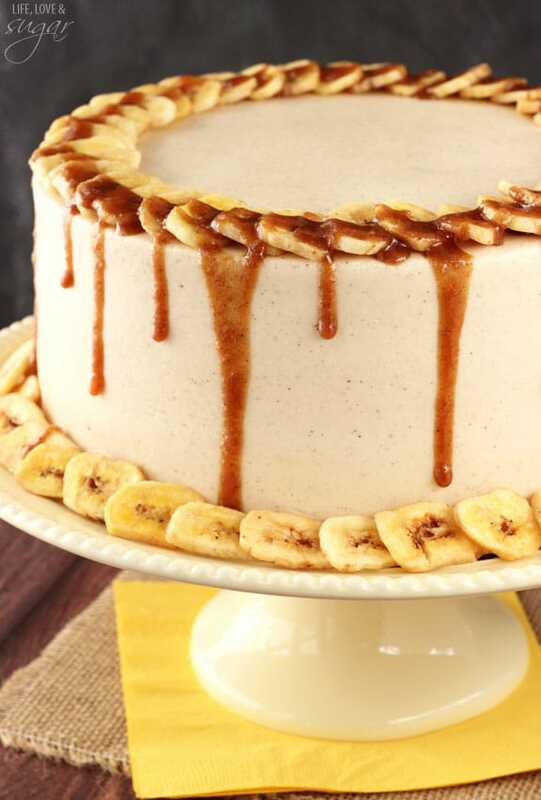 Top cake with banana slices (fresh or dried) and drizzle remaining 3 tbsp of fosters sauce around the edge. Lighting it on fire is kind of terrifying. But I can see that it’s worth it! And that cinnamon cake looks AMAZING. Glad you got some warm weather! That sounds like heaven. Love this cake and love the proverbs bible verse you have on your about page! This is gorgeous! And you know I can never resist anything with bananas. 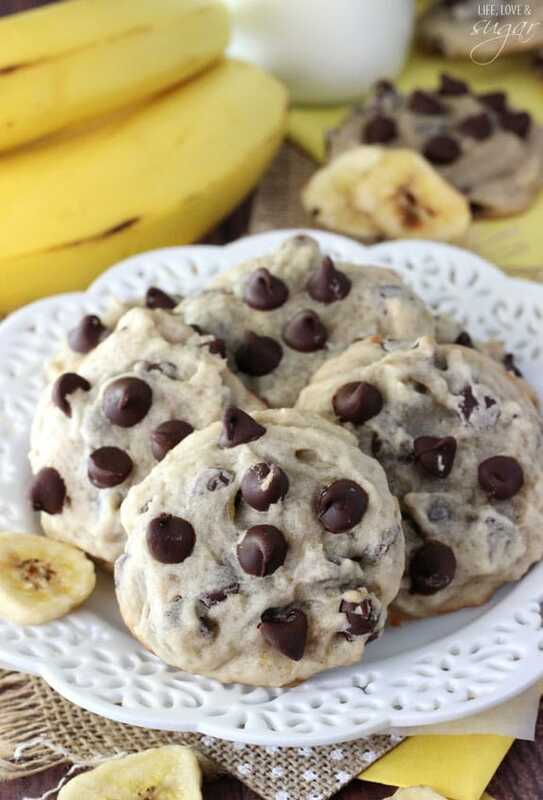 Those banana cookies look amazing too! Help I need some ripe bananas….and now.! 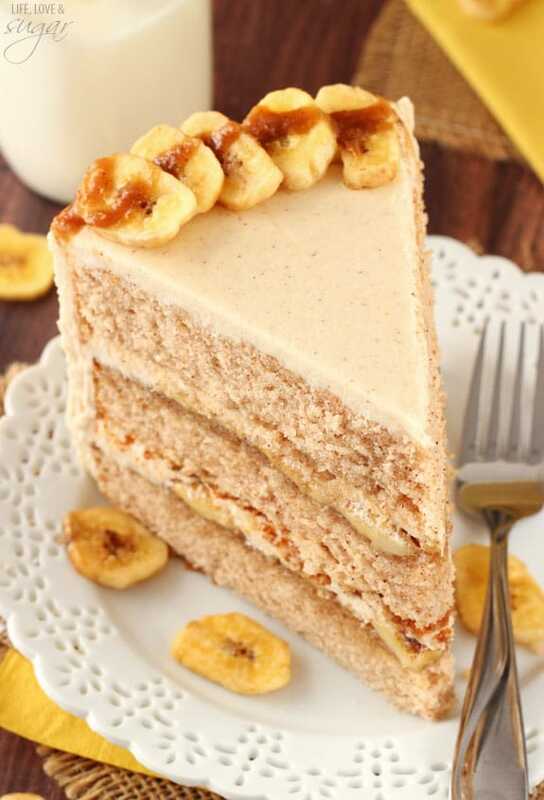 This cake looks completely delicious and a great way to eat bananas. cake is always a great way to eat any fruit. Congratulations to your husband on his citizenship. I agree, full time work and blogging knocks you around. Yay! Congrats to hubby for finally making it through the process. This cake is incredible. 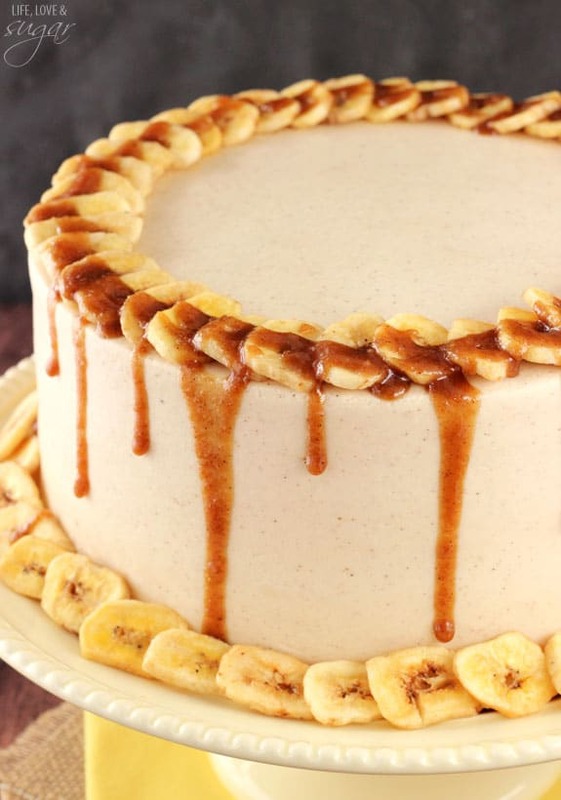 I love bananas foster and need to fill my belly with this cake asap. Yay! Congrats to your hubs on his citizenship! I’m also glad that you are taking more time to yourself. It is the perfect time of the year to enjoy the spring weather. 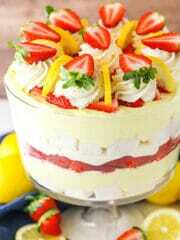 I would really love to enjoy a piece of this cake right now. 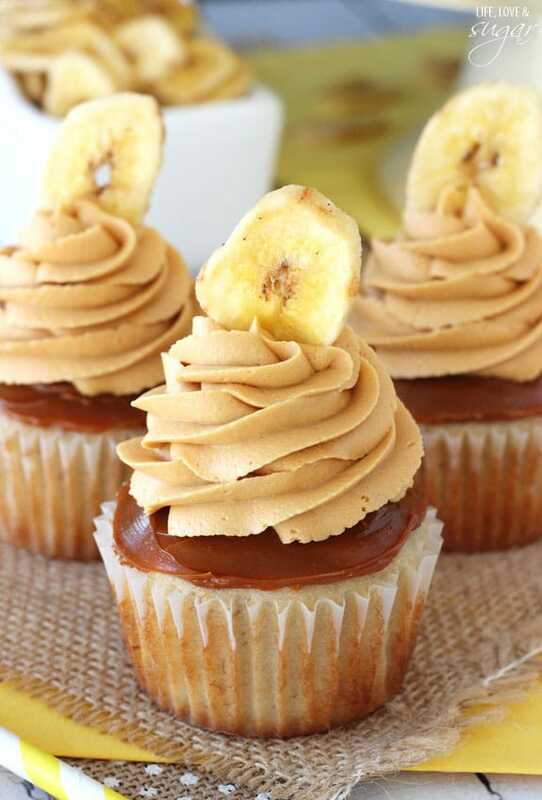 I can’t get enough of cinnnamon and bananas so I am sure that this tastes amazing! HEAVEN on a plate! You are amazing ! This cake is so incredible! I want every last piece all to myself! We also live near Lanier, it’s where we spend most weekends, you know, when there’s no random snow. There are LOTS of dog friendly parks and areas around the Gainesville part of the lake if yall aren’t too far from there, maybe give it a try? Hope yall find some where your fur baby can go as well! Delicious! Your frosting and sauce look amazing! This cake looks so gorgeous! Any tips for making it a little bit ahead (one or two days)? Does the sauce need to be refrigerated? Thanks for this recipe, it looks fantastic! I didn’t refrigerate it, but you could to be safe. 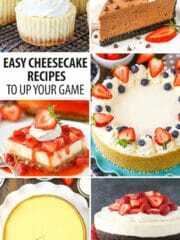 I’d make the cakes (store in an airtight container) and icing ahead of time and then make the rest when you are ready to put it together. Girl! This turned out insanely delicious, and a total showstopper in the looks department. Thank you thank you thank you for this recipe! I just made this sauce for a caramel cake I made. I was wondering if it sets or thickens as it cools. I was thinking of whipping it into some cream cheese icing to frost the cake. Maybe I should add a touch of gelatine to it to keep it from being overly runny? It should thicken a bit as it cools. 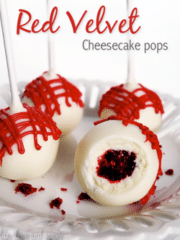 You could definitely add some to a cream cheese frosting. 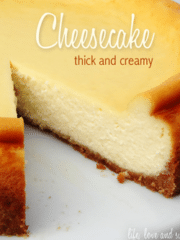 Whether to not to thicken it depends on how thick you want to icing. Gelatin might work, but you could also try adding cornstarch to it while it’s warm. I want to make this for New Years Eve but I am REALLY nervous about lighting the sauce. Do you think it would be a problem NOT doing that and letting the sauce thicken on its own or with some icing sugar/cream cheese? It should be fine to not light it. It does burn off some of the alcohol though, so cooking it down a bit would probably be good. I made this for a Progressive Dinner on my block last night. It was a huge hit! Delicious! The only thing I changed was that I used my kitchen torch to caramelize some banana slices (sprinkled with sugar), which I used as a garnish on top. 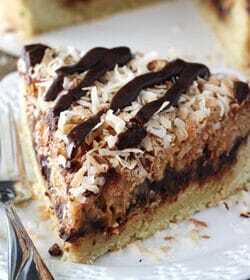 Wonderful flavors in this cake and was pretty simple to make! Thanks for the recipe! Awesome! I’m so glad you enjoyed it! 🙂 One of my faves! Should this cake, once entirely completed, be refrigerated?? That’d probably be a good idea with the bananas in it. I do prefer to serve cake at room temperature though, so I’d suggest letting it sit out for a bit before serving. Is there any chance I can do the sauce with rum flavoring instead of rum? Any adjustments I should make if I do? Kids will be eating it but the birthday boy really wants foster sauce! It’ll taste a little different but should be ok. I’d replace the rum with water so the sauce doesn’t get too thick and use 1-2 tsp of rum extract, depending on how strong you want the flavoring. 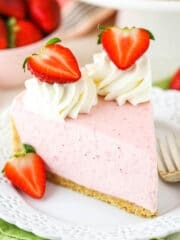 Is there any way to make the cake alcohol free?? You could just replace the rum with water. 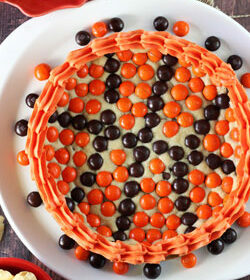 I am going to make this cake on Friday for my BFF’s birthday. Fingers crossed it turns our delish! I have zero luck when it come to making caramel. 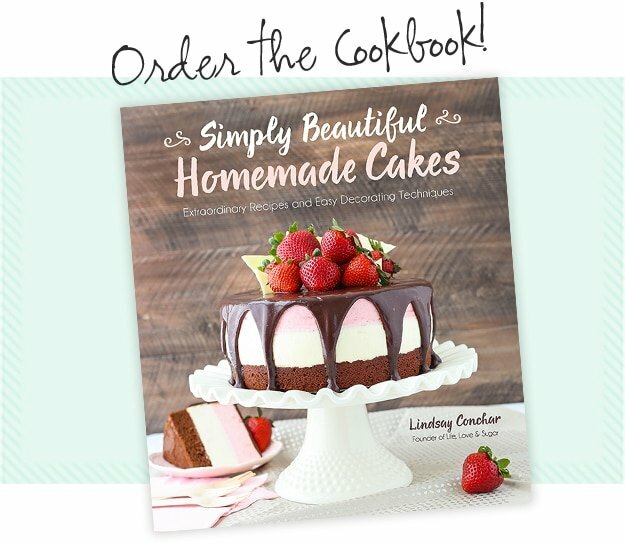 Foster layer cake is easy make at home with your uploaded video guidance. Just made the sauce and it’s not a sauce, just dried up sugar. What went wrong and can it be fixed. I read through the comments and couldn’t find anyone else who had a problem. Any ideas?? You certainly could. I imagine the sauce would be fine without the rum too. Maybe try making it with 2-3 tablespoons of water instead. You just wouldn’t light it on fire. Hi! I’m having trouble with the sauce, I’ve made it 3 times last night and each time it turned hard and not a syrup at all. 1st time I made according to the directions, the second time I followed the directions but didn’t light the rum, the 3rd attempt I cooked at a lower heat and didn’t light the rum. All 3 times resulted in the same hard crumbly mixture that’s not usable at all. HELP! Hmmm, that seems very strange. When melted, the butter and sugar should make a sauce. The only thing I can think is that you’re cooking it for too long.